A woman was piloting the aircraft with her two grandchildren and their mother on board. 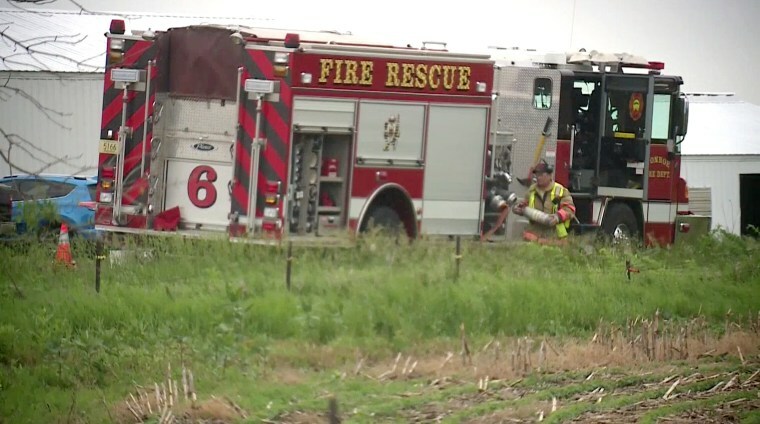 A small airplane crashed in southern Wisconsin on Sunday near a municipal airport, killing all four aboard, officials said Monday. Green County Sheriff Mark Rohloff said the aircraft had been piloted by a woman with her two teenage grandchildren, a 17-year-old girl and a 13-year-old boy, and their mother on board, according to NBC's affiliate in Eau Claire, Wisconsin, WEAU. Green County Coroner Jody Makos on Monday identified the victims as the pilot, Colleen Deininger, 81; her daughter, Melissa Deininger-Dickman, 53; and the two grandchildren, Emmarose Dickman, 17, and Alex Dickman, 13, all of Kenosha, Wisconsin. A witness in Monroe heard the single-engine Cessna 182T lose power and saw the plane descending with flames coming from the aircraft, WEAU said. Firefighters extinguished the flames at the scene. Family members say the group planned to celebrate a graduation Sunday afternoon. The plane was supposed to arrive at the Monroe Municipal Airport around noon after taking off from Kenosha Regional Airport, south of Milwaukee, in the morning, Rohloff told WEAU. The National Transportation Safety Board and the Federal Aviation Agency are investigating the crash.